Tess Durbeyfield knows what it is to work hard and expect little. But her life is about to veer from the path trod by her mother and grandmother. When her ne’er-do-well father learns that his family is the last of a long noble line, the d’Urbervilles, he sends Tess on a journey to meet her supposed kin—a journey that will see her victimized by lust, poverty, and hypocrisy. Shaped by an acute sense of social injustice and by a vision of human fate cosmic in scope, her story is a singular blending of harsh realism and poignant beauty. 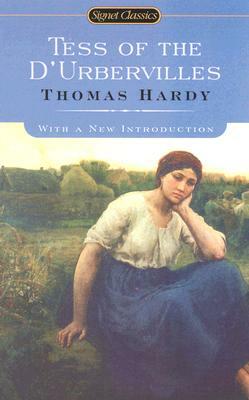 Thomas Hardy created in Tess not a standard Victorian heroine but a woman whose intense vitality shines against the bleak backdrop of a dying way of life. The novel shocked contemporary readers with its honesty and remains a timeless commentary on the human condition. Born on Egdon Heath, made famous in his novels, Thomas Hardy (1840-1928) worked as an architect for several years. But poetry, which he wrote in his spare time, would prove his first and last literary love. By 1874, he was convinced that he could earn his living as an author and retired from architecture, married, and devoted himself to writing. An extremely prolific novelist, Hardy produced an important book every year or two. In 1896, disturbed by the public outcry over taboo subjects broached in his greatest novels, Tess of the D'Ubervilles and Jude the Obscure, he announced that he would write only poetry. In later years, he was bestowed many honors and, upon his death, was buried with much ceremony in Poet's Corner, Westminster Abbey. Marcelle Clements is a novelist and journalist who has contributed articles on culture, the arts, and politics to many national publications. She is the author of two books of nonfiction, The Dog Is Us and The Improvised Woman, and the novels Rock Me and Midsummer.